In 2017 we celebrated the 20th anniversary of Yorkshire Dales Millennium Trust by honouring 20 organisations and people who have made a difference in the Yorkshire Dales and beyond. Douglas Thomson was named as an YDMT Champion and he received £1,000 to continue his important work. We caught up with him to see what has happened since he was awarded the accolade. Dear YDMT, I seem to remember that when you kindly awarded me a Champion’s award I said I would write to you with an update of my voluntary work. My life has not become any less hectic though I have had to change how I spend my time as there are just not enough hours in the day or days in the week. Bringing Broadband for the Rural North (B4RN) to Sedbergh now absorbs much of my time. It is a huge project which will bring a hyper fast broadband service to our town which will considerably help our economic future. It’s not an easy task as bringing it into a town has many different problems. I should finish this project in four to five years! Your award was partly used to start this project. I have managed to continue my other voluntary work too. I remain a director of the Sedbergh Community Interest Company that runs our Tourist Information Centre although I have stepped back from leading it and now just do the finances. I still do the accounts of the Friends of our Church and I continue to keep the paths clear in our churchyard and manage its wildflower area. Last summer, pupils from Sedbergh School (and two from Settlebeck School) laboured very hard in very hot weather on six community projects. As a thanks I was delighted to collect up all the photographs that had been taken and collage them onto a huge card as a way of saying thank you. This summer I am hoping to work with them on our local picnic site that I continue to maintain. Just when I thought things might slow down our local United Reform Church closed. In addition to religious services, the church was used by many community groups for meetings and other activities. Now our brass band, who need a new practice area, along with other community groups, are trying to purchase the building for continued community use. Well, I had to help as I’m the Band’s President and they sort of knew I had experience of fundraising! Is it all worth it? Very much so. I am typing this having just led a walk through our town as part YDNPA’s Tourism Day in Sedbergh. It was a pleasure to show some of the delegates how our Book Town is developing and overcoming the modern challenges of smaller market towns. 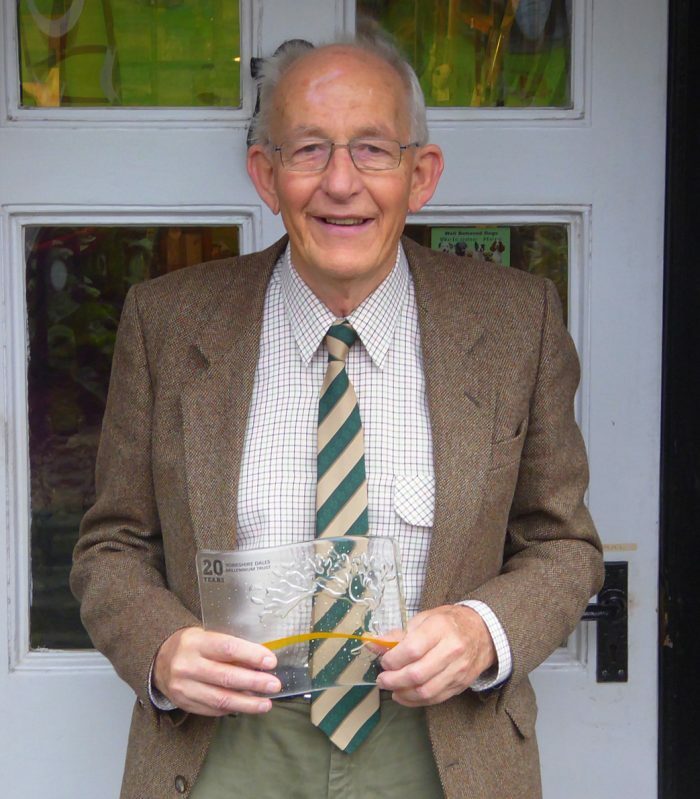 Once again my thanks to Yorkshire Dales Millennium Trust for my Champion award. With my 76th birthday coming up soon maybe this year I will learn to retire properly; but somehow I doubt it!